When I spoke with Shinique Smith in late March, she was feeling a bit like a displaced person. She sold her house in New York in January and moved to Los Angeles at the beginning of February. A quarter of her belongings were still in storage in New York, and she was working out of a shared studio space in Glendale that belongs to a friend. She still hadn’t found a place to live, nor had she settled on a neighborhood that would be the locus of her search. Incidentally, Refuge, her inaugural solo exhibition at the California African American Museum, which opened in mid-March and runs through September 9, revolves around themes of displacement, homelessness, and housing insecurity. 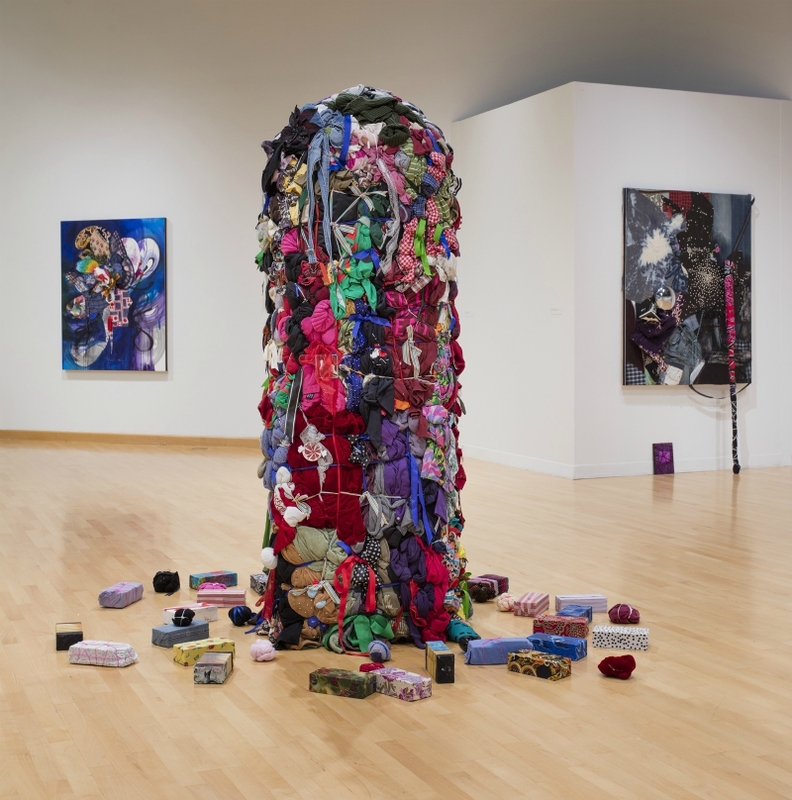 Smith’s own very temporary housing struggles aside, her artworks—many of which are assemblages made of used and discarded clothing and other textiles—seem to resonate with a deep appreciation for the ways in which the affordable housing crisis has colored and shaped Southern California’s physical landscape. Some of the pieces in Refuge are swirling abstract paintings with objects affixed to the canvases; others are totems made of tightly packed pieces of clothing, some of which Smith has actually worn. All the work feels lived in and personal and a little bit like you’re invading someone’s privacy by looking at it. 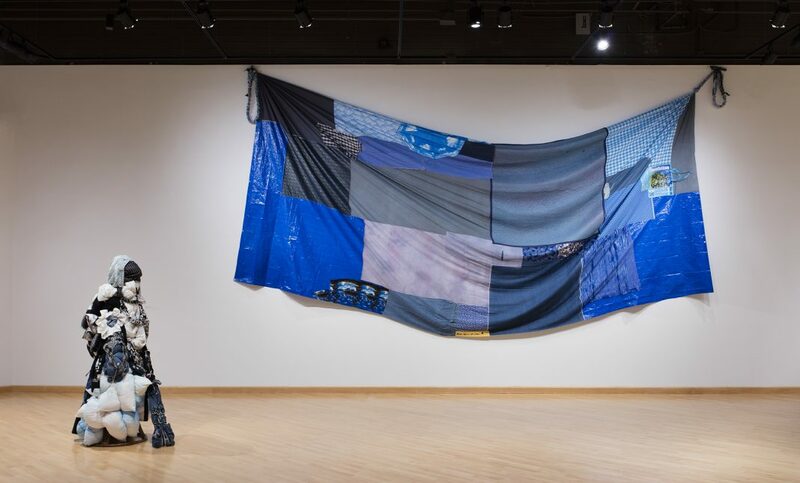 One of the newest works in the exhibit, “Sky Cloth,” is a large-scale drape made from a variety of blue textiles, many of which happen to be widely used in makeshift shelters around Los Angeles, like moving blankets and plastic tarpaulins. One tiny scrap of fabric that’s been sewn into the drape is printed with a repeating tropical motif, a nighttime scene with crashing waves and fan palms tilting in the breeze; it’s a glimpse of paradise amid materials associated with function rather than beauty. The piece feels like it could double as L.A.’s official flag. “It definitely was inspired by the piecing together that one must do [when they are homeless], but I don’t feel comfortable trying to duplicate what people do when they’re homeless,” she says. She’s also using the show as a way to source donations for people who may be in need so the exhibit wouldn’t feel like an “empty gesture.” Given the work’s ties to consumption and waste, she’s always wanted to incorporate commerce into an exhibit, so she set up shelving seeded with things like hygiene products and toiletries and art supplies; visitors are encouraged to bring donations when they visit. Shinique Smith: Refuge is on view at the California African American Museum through Sept. 9, 2018.